Why attending countless Webinars, Conferences, Workshops; reading countless blogs, E-books; watching countless YouTube videos are not helping you in becoming an expert and what actually will? Well, experts do not have false beliefs. False belief #1: I can figure it out on my own. If i just read enough articles, watch enough YouTube Videos, go to enough conferences, i will figure it out eventually. I had this false belief for many many years. If i haven’t become an expert so far, it is because i haven’t read enough articles, watched enough YouTube Videos, attended enough conferences….I used to think like that. So i spent hours every day in consuming all of the information i could find. But that did not make me an expert. It was frustrating to realize that all of the hard work wasn’t taking me anywhere. Then one day I realized that it wasn’t my fault. It is the fragmented knowledge that wasn’t taking me anywhere. The free information that i was getting from all over the internet is fragmented and so not very useful. There are lot of youtube videos on flying a commercial aircraft but will that make you a pilot?…. no. There are lot of youtube videos on surviving in the wild but will that make you a survival expert?…. no. They all give you different pieces of a puzzle and then leave you to figure it out on your own. There is also lot of information out there which is either downright wrong or which you don’t really need. How do you know which information to trust, which information to ignore and where to really focus? Then I discovered what all the top experts have in common. They all have got coaches and mentors and not just any coach but world class coaches and mentors and not just one but many. I also discovered that nobody succeed on his own and self made man is a myth. If i wasn’t coached by ‘Avinash Kaushik’, my web analytics career would be in a very different direction today. Think about it. All of the information is out there available for free. Internet provides free information on every conceivable topic. All you have to do, is to use Google. So why spend any money on buying the same information in the form of a course, book or any other form of training? And all of these people who enrol in expensive courses, buy books and attend conferences and mastermind programs are just plain stupid. They are wasting their money on purchasing the information, which is readily available online for FREE. I used to think like that. But then one day, I realised that if free information was the currency of success, then everybody would be an expert, a millionaire with six pack abs. There would be no need for coaches, teachers and mentors. People would just google whatever information they want and then become an expert in their chosen field. But amazingly, even tons of free information is not making everybody an expert. Amazingly, watching countless YouTube videos, reading countless blogs, and ebooks is not making everybody an expert. So what is wrong with the picture? “They don’t have skin in the game”. When you consume free information, you are not obliged to act on it. Nobody will hold you accountable for not taking any action. You really have nothing to lose, whether or not, you choose to act on the free information provided to you. In other words ‘you don’t have skin in the game”. However, if same free information is wrapped up in the form of a US $3000 course and sold it to you, you will most probably take action and you will most probably get results, unless you do not mind wasting $3000. That’s is why coaching programs, mastermind groups and formal training still thrive in the world of free information. They create an environment where you are hold accountable for not taking required actions. They create an environment where there is a risk of monetary loss, if you fail to implement what you have learned. They create an environment where you learn a new skill, step by step, from start to finish. They create an environment which speed up your learning process. There is a structure and process in place which guide you throughout your training. And that’s is why, even when all of the information is available out there, for free, I still don’t mind paying for it. I still enroll in courses, attend paid webinars and believe in learning from the best. What i have discovered through my own training programs and the training programs of others is that people learn the best and get results when the stakes are high, when they have a ‘skin in the game’. they need to prove it to themselves that they have not made a mistake by buying such an expensive training program. Most importantly they don’t want their friends and family to believe that they made the wrong choice. This constant need to justify their investment motivate them to consume all of the information provided to them and most importantly take action. This constant need to justify their investment push them to get results. This is also the reason why many people tend not to buy expensive training programs. They don’t want to experience that discomfort which comes with the need to constantly justify their investment and feel pressured to get results. This is also the reason why many people tend to buy cheap courses. They purchase the course to satisfy their need to learn a new skill. But since the course is cheap there is really no pressure to justify their investment and get results. I mean how much pressure you can experience from a $10 course which constantly push you to get results? That is why, you won’t hear from anyone saying ‘oh that $10 course changed my life’. False belief #4: Cheap information can make me an expert. This is one of the hardest false belief to change for majority of people. I had this false belief till last year. I used to think that people who attend expensive conferences, workshops and esp. mastermind programs (which cost anywhere from US $5k to $50k) are plain stupid. They are wasting their money on buying the information which they can readily get somewhere else for cheap or free. You won’t come out with godly, out of this world wisdom when you attend a mastermind program which cost $20-50k a year. You get access to the same information which is available elsewhere for cheap or free. However you do get access to some information which is not available to all. And that information is what not to do and where to really focus. The world is against you in the sense that it keep telling you what to do to become an expert. Read this, do that. But it does not tell you what not to do to become an expert which is 10x more important to learn and understand. Success in life really comes from what you say ‘no’ to. If through a mastermind group, you get the chance to meet say ‘Arnold Schwarzenegger’ in person and you ask him what is the secret of success, he will tell you his six secrets of success. These are the same secrets which you can find it out for free on YouTube. When Arnold Schwarzenegger tell his 6 secrets of success in person to you, it will have profound impact on you, most likely it will change your life forever. It is a psychological thing. I have purchased many courses in my career and now when i look back to see which courses really helped me, they are the one on which i spent sh*t load of money. I also discovered couple of long forgotten $10-$20 courses i bought from udemy. I bought these course with the good intention of starting and completing them but somehow never found the time to take them. And now i understand, it is not the time but the price. The course price wasn’t high enough to justify investing time in it. As weird as this may all sound but we humans are not creature of logic. We are creature of emotions. Have you ever enrolled in a very expensive training program? I mean the program so expensive that you have to justify investment to your spouse, friends…… uncle charlie. The program so expensive that it takes away your 1-2 months of entire wage. The program so expensive that you have to borrow money from friends or banks or get into credit card debt. If your answer is NO. Then here is the real reason why. You are afraid that you won’t be able to justify the investment. But why you won’t be able to justify the investment? Because the program is so expensive? The real reason is you would be pushed to get great results….. to the level where you can recover your entire training course cost. So if you are purchasing a $10k training program, you have to recover this entire training cost by getting results. The moment you purchase such an expensive course, it will put you in great discomfort. You will immediately feel like $10k in debt. This is a great discomfort. The other discomfort is that now you have a huge investment to justify, not just to yourself but also to your family and friends. You must get results or you risk loosing your investment. You will experience this constant need to justify your investment and it may drive you nuts if you don’t get results. However this constant need to justify your investment is what really motivate you to consume all of the information provided to you and most importantly take action. This constant need to justify your investment is what will really push you to get results and you will get results unless you don’t mind wasting $10k. That is why people who enrol in expensive courses/programs or mastermind groups tend to perform so much better and get result.. This is because they have a huge investment to justify… they need to prove it to themselves that they have not made a mistake by buying such an expensive training program. Let me tell you, how much web analytics training cost me. 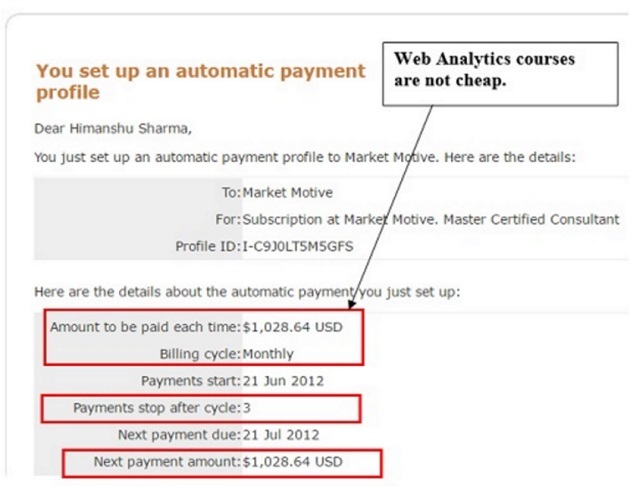 I spent US $3000 of my own money to learn web analytics in 2012. Spending over $1k each month. That was in the year 2012. Some 6 years ago. Since then I have acquired 10x more knowledge through my own efforts and it is ever increasing. Had I waited long enough, I may have missed my chance to be coached directly by Avinash, as his company was acquired by ‘Simply Learn’ back in 2015 and he is now, no longer coaching new students. That’s how people miss opportunities in life. When something is offered to them they don’t grab it straightway. They think more about the price than the benefits and procrastinate. And when they are finally ready, the opportunity is no longer available. Likewise, you can read countless stories of people who enrolled in a very expensive training programs like Tonny Robbins ‘Date with destiny’ and which literally changed their lives. If you want to achieve exponential growth in your life and business, be prepared for big investment in your training. And this investment does not always have been to monetary. It can just be, in the form of extremely hard work. For several years i did not read any article or book which was not related to digital marketing and analytics. That was a big mistake. If i could go back in time, i will tell my younger self to read as many self help books as possible. I had this false belief that if i just read enough articles, watch enough YouTube Videos related to my niche, it will help me in becoming an expert. The epiphany that i had that fragmented knowledge is not taking me anywhere came from reading books outside of my niche. I learned the importance of coaches and mentors from reading books outside of my niche. If i wasn’t coached by Avinash Kaushik, my career would be in a very different direction today. Most people want to become an expert overnight. They know that they can’t but wish it anyways, sub-consciously. And this wishful thinking start sabotaging their efforts. All of this happen at the sub-conscious level. It is like a silent killer. Many people who undergo a training and who give up long before they are in a position to see results, suffer from such wishful thinking. Even if you have access to world class coaches and mentors and best available information, it takes time to get results. It is true that mentors and coaches will greatly reduce your learning curve but you still need to invest lot of time in practising what you have learned. Just consuming the information is not going to help. You need to practice what you have learned every breathing minute. And this practice could take months and years. This is what separates one student from the other who both are coached by same world class mentor. So just because you have access to world class training program does not automatically make you a world class expert. You need to put your own efforts. At the end of the day, you are responsible for your own results and nobody else. You can hear ‘N’ excuses from ‘N’ people regarding why they can’t complete the course. Quitters never blame themselves for anything. They always blame others for their failures. First of all courses are not meant for entertainment. If you want entertainment, go watch ‘YouTube’ or ‘Netflix’. I don’t think anyone really enjoy being trained or taught about anything. They go through the training with the end goal in mind and i.e. to learn new skills and become an expert. I don’t like statistics, yet i force myself every day to learn some more. You are no longer in a kindergarten where the only way you can learn is when the teacher sing a song, play interesting games, show you an educational movie or draw funny cartoons on the whiteboard. It is important to consciously realize the fact that not everything that can help you in becoming successful is something you will really enjoy doing. This is what we call ‘struggle’. If there wasn’t any struggle, everybody would be an expert with six pack abs and million dollars in their bank account. If you are really training hard to learn and master a skill, there is going to be a lot of discomfort. And if your training is not bringing you discomfort then you are training it all wrong. As ridiculous as this may all sound, many people approach training programs with such mindset. They don’t want to learn and master the basics, they don’t want to put any efforts but they want instant results and become experts. You are not training to become a boxer. So you do not have to endure knockout punches for every mistake you make in your training. You do not have to go through gruesome physical training. You are also not training to become a doctor, soldier or a marine. There is no drill sergeant appointed for you who scream on your face and torture you both physically and mentally every single day until you pass out. You are training to become an expert in the IT field which is lot less demanding both physically and mentally. All you have to do become an expert in the digital marketing and analytics field is, sit in front of a computer with a cup of coffee in a nice comfortable environment and go through the training program. So comparatively your journey to becoming an expert is a walk in the park. This course is asking me to do the work, it’s a scam. Yes thats how most people approach online courses and training programs. They buy the course, like they are buying a pill. They consume the information from the course just like they are swallowing the pill. Then they just wait for the result to happen. If they get the result they are after, then the pill is working. This pill mentality is a learned mindset formed from childhood and is practiced all the way into adulthood. People with such mindset can never benefit from any course or training program. You will often find them online, asking for refunds or screaming ‘this is scam… that is scam’. They do not want to do the work. So whatever the coach is asking them to do, they don’t want to do it. They either doubt it or they just can’t be bothered. Their end goal of taking a course is to get the same results they get, by just swallowing the pill. They want magic pills for everything in life.